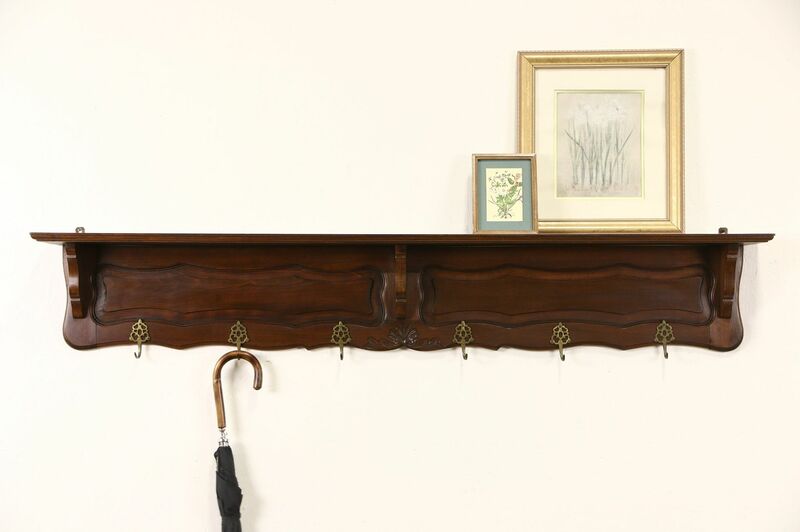 Hand carved in Holland of solid beech hardwood about 1900, this wall shelf has brass coat and hat hooks. There is a groove to display plates if desired and panels are shaped and raised on this Dutch antique furniture. The original finish is very well preserved and has been waxed and buffed, so that an occasional wipe with a soft dry cloth is all that is needed to maintain its patina. Measurements are 63" wide, 8" deep and 11" tall. See 11 photos on Harp Gallery website that enlarge to full screen size.